Will it make you go radio ga ga? 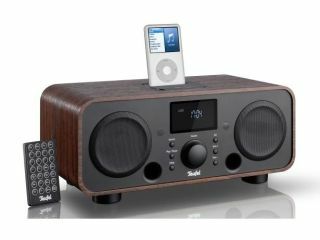 Online retailer Teufel has announced the arrival of its latest iPod dock, the iTeufel Radio v2. Now the eagle eyed of you will have noticed that this is the second incarnation of the iTeufel Radio (it's not called v2 for nothing). This update to the series offers better audio and comes equipped with 2x7.5W speakers and 35W subwoofer. For those who like a bit of bass in their face, you will be pleased to know that you can now adjust the bass to your liking. Other improvements include the screen, which has less glare than the previous versions and it is also easier to read at night. As well as pumping out the tunes from your iPod, you can also use the dock as a bedside radio. There is no DAB functionality though – the dock is going old school with FM. The iTeufel Radio v2 iPod dock is available online from Teufel now and costs £179.